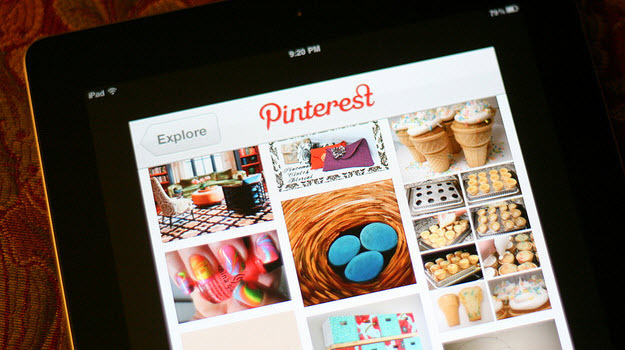 Do you love Pinterest so much that you’d like your blog to look like it? 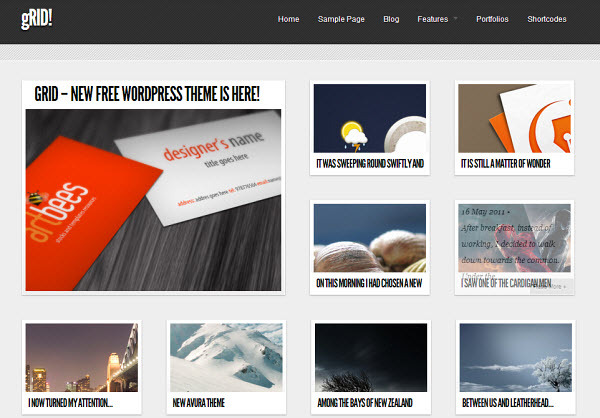 If so, this list of free WordPress themes is just for you. Pinterest needs no introduction. With its fluid, grid-based design the social network is currently the fastest growing site ever. Pinterest’s beautiful, eye-catching layout focuses on images and makes it the perfect inspiration for any photoblog or portfolio. Whether you’re an artist, graphic designer, or photographer, these Pinterest-inspired WordPress themes are a great way to showcase your work. They’re also great for photobloggers and those that really want a true focus on thumbnail images. First we have iPhoto, a responsive Pinterest clone. Each blog post is represented by a thumbnail and displayed underneath are the number of views, photos and comments for each post. iPhoto is widget ready, Gravatar ready, can auto re-size thumbnails, and supports a custom navigation menu. The live demo is not working, so you won’t be able to fully test it out. Fortunately the file is still available for download if you’d like to use it. 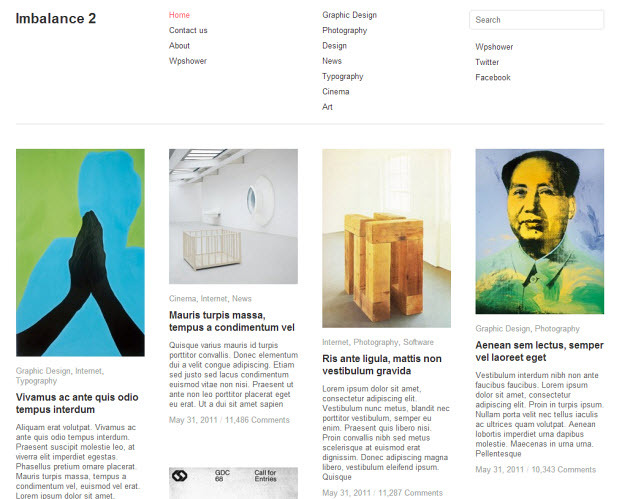 Imbalance 2 has the same grid-based layout as Pinterest, but is unique in a few areas. For starters the header contains many navigation and category links, as well as links to Twitter and Facebook; there are no drop-down menus. You’ll notice a neat little effect when you mouse over a blog post on the home page; the background will change colors (letting you know that it’s selected). Imbalance 2 also includes theme options, Google Analytics integration (just paste in your code), built-in social bookmarking buttons, custom menu locations, fixed and fluid layout types and more. 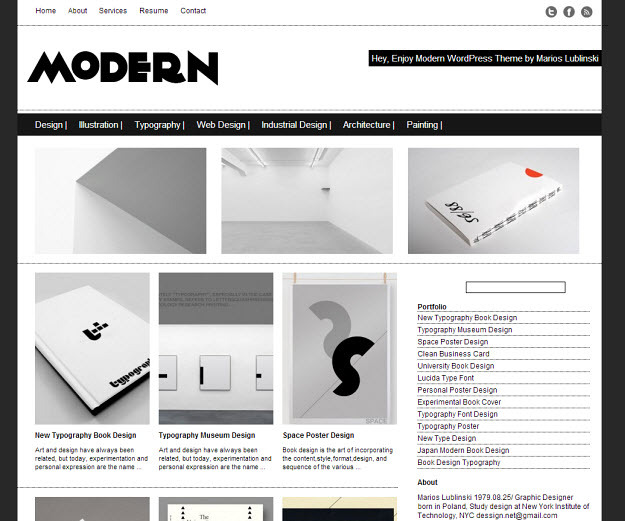 Modern is a fixed, grid-based WordPress theme. Unlike most Pinterest-inspired themes, it includes a sidebar on the home page. There’s also a header with two navigation menus and space for a nice horizontal logo and tagline for your blog. Modern was created so that the focus of your blog is on your artwork, not the theme. This makes it a great choice for artists, designers and photographers. You may also like Minimal, a similar grid-based theme by the same designer. 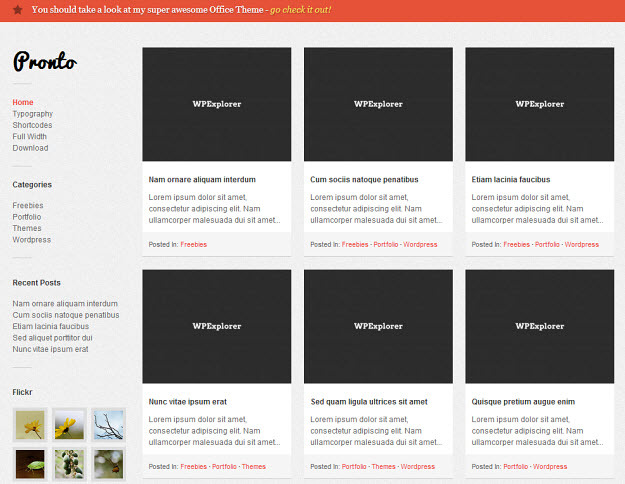 This is the lite, free version of the Skaken Grid WordPress theme. It’s a beautiful grid-based theme that is fluid and responsive. Skaken Grid (Lite) includes two color schemes, theme options, and a widget ready sidebar (on single pages). 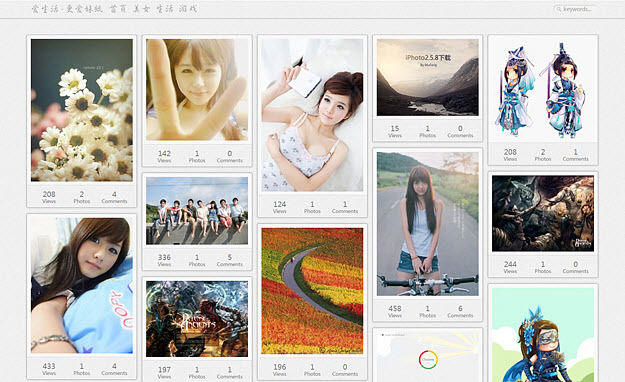 This theme has a focus on photo galleries and it shows. When you click on any thumbnail from the home page, you’ll get a full-sized overlay containing the image. You can also navigate through the rest of the images from the home page in a gallery format. 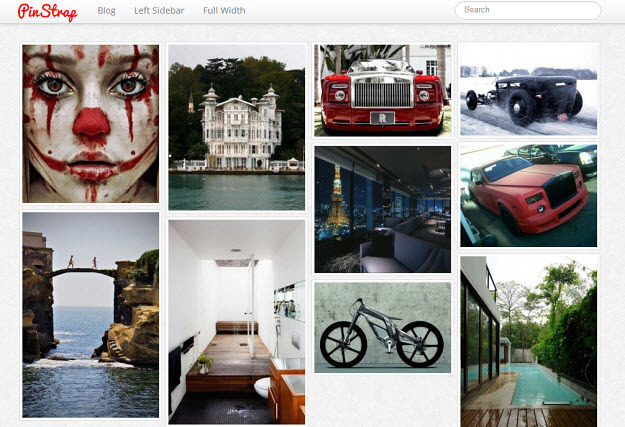 gRid is a bit different from Pinterest; it’s a four-column grid-based theme. You’ll notice that all thumbnails on the home page are the same size except for the featured post in the top left corner; it’s about four times the size of the regular posts. One of the unique things about gRid is that it has automatic post thumbnails. This means that you don’t have to use the featured image widget (in your blog editor) to specify a thumbnail; gRid can use the first image in your blog post. Pronto is my favorite Pinterest-inspired theme on this list. 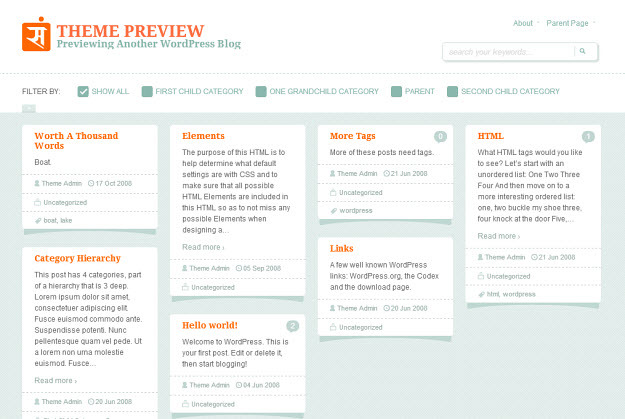 It’s a fixed grid-based theme and includes a fixed sidebar on the left. When you mouse over a thumbnail, it’s slightly illuminated to show that it’s selected. On the homepage each post also shows an excerpt and categories underneath. Besides being responsive, it also includes a notification bar at the top of the page. This is great for displaying announcements and other importance notices. Pronto includes custom widgets, author pages, PrettyPhoto lightbox support and more. 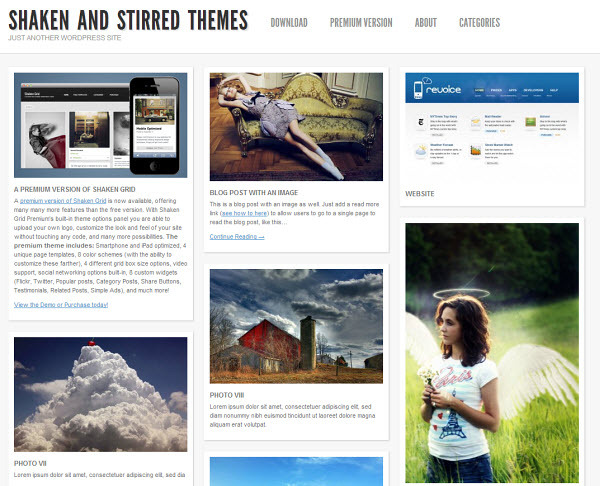 This theme was featured in our Top 5 Free WordPress Themes of the Month for September 2012. It’s fully responsive, lightweight and includes customizable menus and widgets. One thing that stands out about Sampression Lite is, “it supports sticky notes with special effects and allows for the best placement of featured images on posts. Finally we have PinStrap, a responsive Pinterest clone very similar to iPhoto (mentioned above). It includes a widgetized footer, which can fit up to three widgets. By default the sidebar on single pages is on the right, but you can also move it to the left if desired. PinStrap includes theme options, sitemap and full width page templates, and colorbox lightbox (when clicking on a thumbnail on the home page). What is your favorite Pinterest-inspired theme for WordPress? Are you using a theme that resembles Pinterest on your blog? If so, which one are you using? Pnstrap is definitely working out for us. Great themes if you’re dealing with an image heavy site. Hi thanks for sharing those grids..I think pronto will serve my purpose. I am agree with Tommy. iPhoto look fantastic! iPhoto look fantastic for my celeb instagram blog. I’m interested in setting up a Pinterest style site. Since you are so good at getting your blogs seen, are you able to help me get exposure? Nice post. These all are really cool themes. I want to try it to make my blog picture friendly. I love that iPhoto! Its probably the most practicle, bit too much setup for me tho… i am a bit lazy when it comes to setting up a theme. Thanks a lot Charnita for the list, Its a great collection of beautiful websites. Can you update the link for iphoto? I tried but it is not working. iPhoto cannot be downloaded from your posted link. This link also not working . Anybody have backup copy? Good selection! Wished I found this before I got mine (premium pinterest theme)! Thanks for mentioning PinStrap. People seem to be enjoying it! I’m surprised that Pinboard didn’t make the list. Ah yes, Pinboard is another great one that was missed. Sadly, not all could make the list. Pinboard was a bit of a pain when it came to customizing – at least for me, but it’s a great design none-the-less.